Well it’s official! 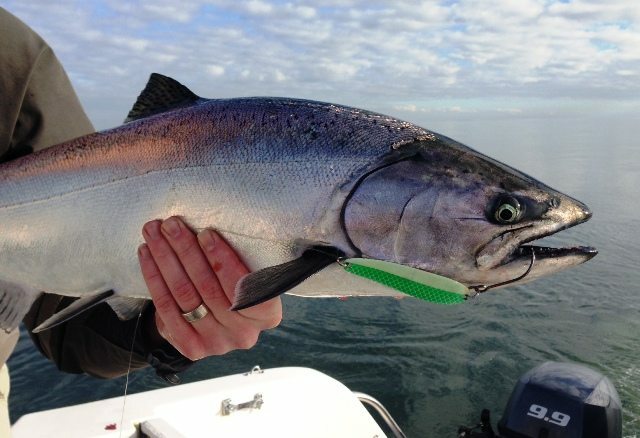 We are past the mid point of the month and the winter chinook season has started. On the days where the wind has not been too strong boats have been out and they have been into fish. There are still a lot of undersized fish around, but that is actually a positive sign as these fish grow like weeds! In a couple of months they will be large enough to keep, that means over 62 cm. Amongst all these aggressively feeding smaller fish are some keepers. You may have to weed through the little guys right now, but there are definitely some really nice size fish that have been taken this week. First light and a snowy Stanley Park and Lions Gate Bridge in the back ground from last Season.